Garbage disposal units and food waste disposers are a clean, hygienic, convenient way of disposing food waste. We specialise in repairing, unblocking, unjamming and replacing all brands of kitchen waste disposal units. 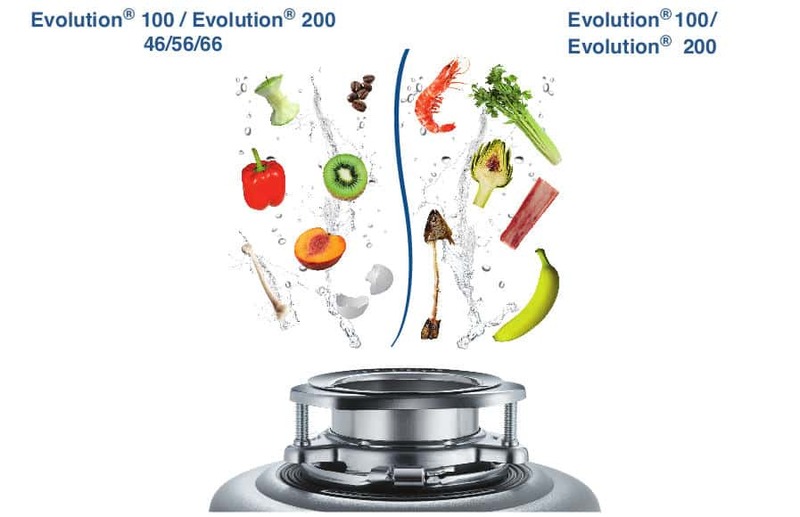 Insinkerator food waste disposers are the most commonly install units. 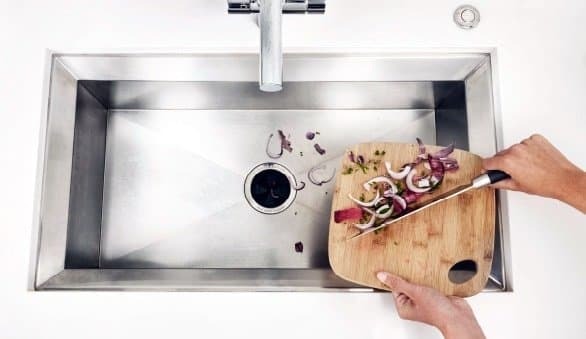 If the garbage disposal unit is no longer required, it can be removed and a bypass installed to convert the pipework back to a standard kitchen waste line. How do kitchen waste disposal units work? With the COLD tap running at a moderate flow, food scraps are fed through the waste disposer unit. The machine grinds them up into fine particles which run through the machine and flushed out into your kitchen waste line. What waste can be put through a kitchen waste disposal unit? Garbage disposers are capable of handling most of your kitchen scraps like vegetables, meat scraps, fish, coffee grounds, eggshells and general kitchen waste. The variety of waste can vary depending on the size of the unit. More fibrous foods like celery should be avoided unless you have a larger unit which generally feature two-stage grind technology to allow the more difficult waste to be disposed. Only natural food waste can be put into the disposer, no feathers, string glass or plastics. Listen for the noise change of just the running motor once the food has gone through. Allow the cold water to continue to run for a few seconds after the food is disposed of to flush the unit clean. FOR THE BEST PRICE, SERVICE AND ADVICE! The purchase of a new fridge can be a major expense so you want to ensure it is installed correctly. These days there are a wide range of fridges that can hold ice and chilled water on tap. These ice-maker fridges require a constant connection to a water supply – that’s where we’re here to help. If you don’t already have the plumbing in place, to install your ice maker fridge we’ll need to run a new cold water service from the nearest existing cold water line. A tap will be installed at the new fridge location and the fridge connected to it. In some instances, it may also be necessary to install a pressure limiting valve to the fridge water service. 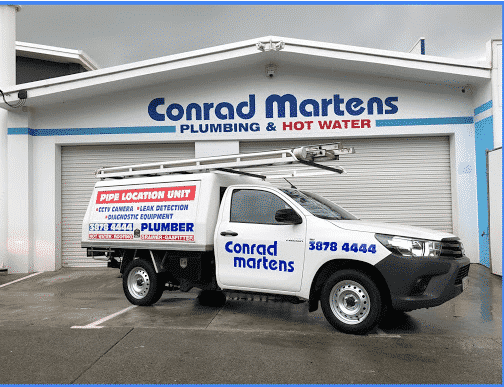 To arrange a licenced for your ice-maker fridge installation, give our team at Conrad Martens Plumbing a call. Dishwashers are among the most common appliances our Brisbane plumbers regularly install. It may seem easy but it’s the kind of job that if it’s done incorrectly can cause a big mess. Poor installation can result in blockages or leaks which may result in flooding and damage to your kitchen. It’s worthwhile to have a plumber do the job for your peace of mind and to make sure everything is working properly. No job is too big or small. If you’ve had a dishwasher installed before, a quick change over of the appliances should be all that is required. If you like, we’ll even take the old one away for you. For new installations or where alterations are required, we’re well experienced to handle the job. We regularly extend, repair or replace the associated plumbing to suit the various dishwasher styles. Our plumbers provide fast and affordable installation for stop taps, inlet hoses, outlet hoses and dishwasher water services. If you don’t have a power supply nearby, we can arrange that too. We are affiliated with local electrical trades who can install a power point where required. To assist with your dishwasher installation, please give team a call to arrange your job today. As people are becoming more aware of the importance of drinking water quality, there is an increase in demand for water purifiers. Water filtration systems ensure you have cleaner and better tasting water. There are a wide range of filters available. Starting at single filter systems to the kitchen sink tap, to twin under sink filters and then filtration systems that service the whole house water supply. Our plumbers install water filter systems and replace filter cartridges in all under-sink water purifiers and a range of configurations. Contact our office to assist with a range of water purification options.